Pacific Grove Municipal Hole 3: A short dog leg left par 4 with ample trees left and OB right. A short drive is all that is needed, but it should be right of center to avoid being blocked by a large cypress tree 50 yards from the green, that has a large bunker front and rear and is steeply sloped. A big bomb can, however, fly the trees to leave just a pitch to the green, but there is a big bunker to the short-left of the putting surface that makes this a bad idea, depending on the pin placement. Pacific Grove Municipal Hole 4: Another short par four, this one can be driven and has great views to left out over Monterey Bay, but over the green is down a hill and OB (so is right), so some caution should be exercised. The green is guarded by bunker and has tricky undulations. Try not to hit any deer either. Pacific Grove Municipal Hole 6: A tight par 5 that dog legs right and careens down a hill approximately 100 yards from the green. Avoiding the cypress trees on the first two shots is the key to scoring well on this enjoyable hole. Two symmetrical bunkers wonderfully front this green, which is sharply pitched from back to front. Pacific Grove Municipal Hole 8: The longest par four on the front (by over 100 yards) is a dogleg right with OB on the right. 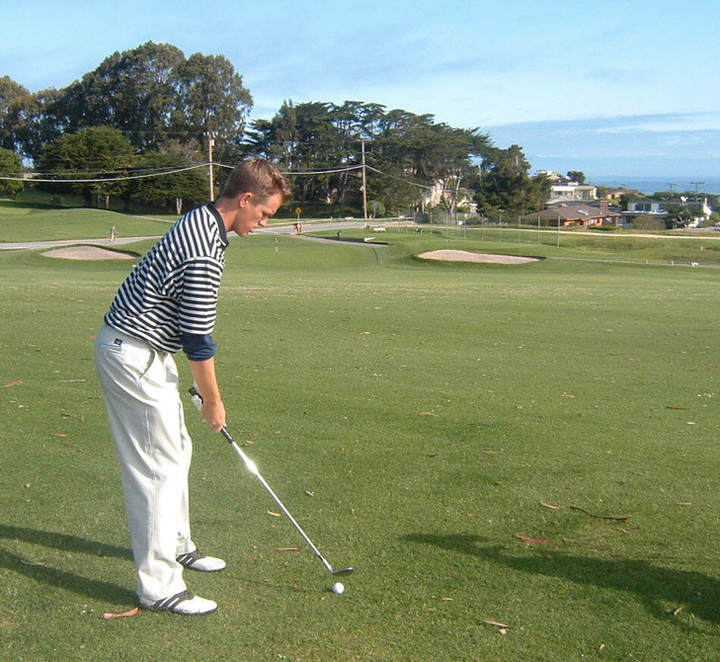 If a good drive can be hit, the approach is fairly wide-open to the green. Pacific Grove Municipal Hole 11: The view from the tee shows a lot of the back nine and is quite glorious on a clear day. The hole itself has a wide fairway and is short, but there is OB to the left. The green is very small and has a slope front that will reject shots and a dune long that will possibly grab a shot that goes over, leaving an impossible chip back down to the green. Pacific Grove Municipal Hole 12: One of the prettiest driving holes anywhere. The views of the ocean, dunes, ice plant and fairway are outstanding. However, the golfer cannot be distracted as the ideal shot is played over the leftmost dune on the right side and anything right of that is dead. Once this shot is mastered, the rest of the hole is wide open, but still pretty all the way to the shallow and elevated green nestled against a hill covered with ice plant. Pacific Grove Municipal Hole 13: A short, but solid par four where the courageous drive over the cone-shaped sand dune will leave a visually enticing chip shot to a green with a 30 foot high sand dune towering behind it. Pacific Grove Municipal Hole 15: The longest and most uphill par four on the back nine has dune to the right of the fairway. The player can bailout left but the approach from there to the green is a very bad angle, as the green's shape is much more forgiving from the right side. especially to left or back pins. 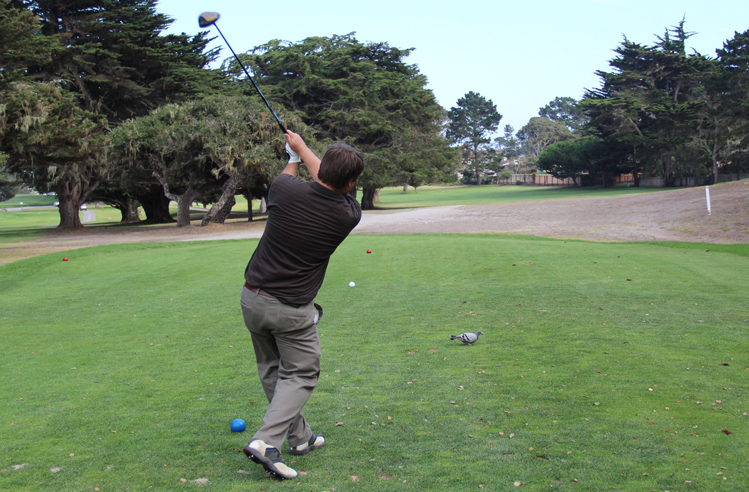 Pacific Grove Municipal Hole 16: Maybe the widest fairway anywhere will greet the golfer on this downhill hole. 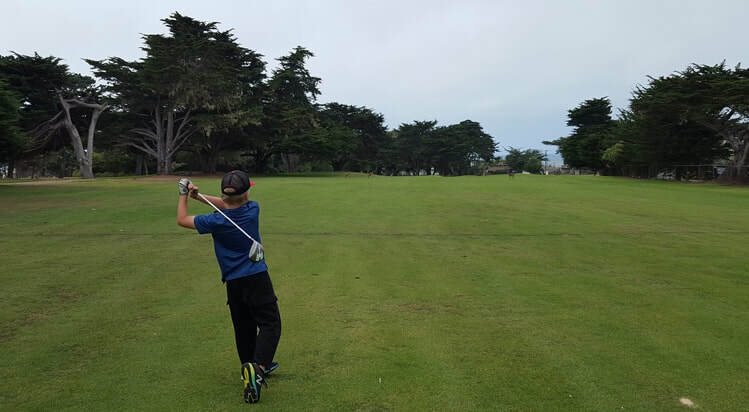 The drive must crest the hill, and it will funnel down, leaving a short to mid iron with the Pacific full view in the background behind a green with a deep bunker front right, and a picturesque lake way right for the pathetically pushed shot. Pacific Grove Municipal Hole 17: The drive on this par three simply has to clear the water well short of the green as there is not too much else to worry about.